Jon Stewart, “The Daily Show”, October 6th 2011. Also, a moving tribute by Stephen Colbert: http://thecolbertreport.cc.com/videos/fottda/tribute-to-steve-jobs. Every class that wants to support weak references must implement IWeakReferenceSource, where the method GetWeakReference provides a weak reference for the object. The interface IWeakReference exposes the method Resolve, which resolves a weak reference by returning a strong reference to the object. We know that two “kinds” of C++ can be used to work with WinRT objects. There is the old, plain C++, with COM interfaces, and there are several language extensions (named C++/CX) which offer syntax very similar to the old managed C++/CLI, completely hiding the details of the underlying COM implementation. The C++/CX extensions are certainly the recommended way to work with WinRT and should be used as much as possible. From what concerns weak references, the Windows Runtime Library, wrl.h, provides some helper C++ (not C++/CX) smart pointer classes and also a WeakRef class that wraps the interfaces above. These classes can also be used in C++/CX code. As explained here, WinRT system components generally implement IWeakReferenceSource, so if our reference cycle includes one system component, it can be broken. This code sample, also taken from here, shows how to use a WeakRef with a standard PropertySet collection. Compiled with: cl.exe /ZW /AI C:\Windows\System32\WinMetadata, the code above causes a circular reference and the ~Foo() destructor is never called. But adding /DWEAKREF to bring in the WRL::WeakRef code, we can see that Foo is properly destroyed at the end of the scope. Unfortunately, the classes declared using the ref class extension do not implement IWeakReferenceSource, so there is no easy way (at least, in this pre-release version of VS11) to support weak references in custom classes. So, the only solution I found to implement a WinRT class that supports the IWeakReferenceSource interface is to follow the “not easy” way: disable the WinRT extensions (the /ZW compilation flag) and use pure, good ol’ C++. There is one of the WinRT samples (the “DLL server authoring sample”) that shows what to do and it’s a very useful reference. Weak references aside, manually implementing a WinRT class is a very useful experiment, which shines a light on the details of the internal WinRT machinery. The procedure to follow to implement a WinRT object is not very different from the one that was required to implement COM objects with ATL, in the past. /metadata_dir "C:\Program Files (x86)\Windows Kits\8.0\Windows Metadata"
/winrt /W1 /nologo /char signed /env win32 /winmd  "<file>.winmd" /h "<file>.h"
One of the nice things of RuntimeClass is that, by default, it is configured to automatically implement IWeakReferenceSource. So, weak references come for free with the code above. This is all. 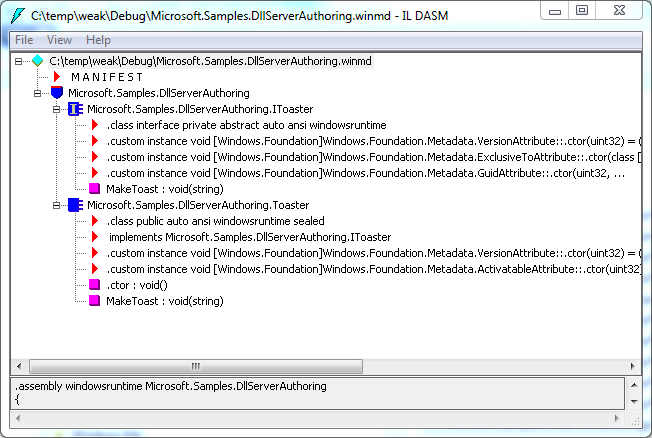 The DLL, once compile, will be the “COM server” for the WinRT “Toaster” class, which supports weak references.